I have swelling in my gums between my back two molars on my left side, the swollen part has become a purple color. It's not extremely swollen but looks round and shiny like a tiny balloon. It is also not painful. The swelling started a week ago, but the purple color has happened in the past couple days. What could this be? I already had my wisdom teeth pulled years ago, so I know that's not it. The earliest I could get an appointment at the dentist was 2 weeks from now, so I hope it doesn't get worse or hurt before the 2 weeks is up! I have been brushing and mouthwashing with ACT mouthwash 2x a day, and flossing once a day. It has not gotten any better. Diagnosis 1: It can be "Pyogenic Granuloma" which is a common gingival infection occuring due to gingival trauma or gum irritation. This time of swelling usually occurs in between the gums. The area is termed as "Interdental gingiva". Dont poke or touch the swelling as it will profuse badly. Treatment 1: Scaling is advised and if the swelling is large than go for surgical excision. 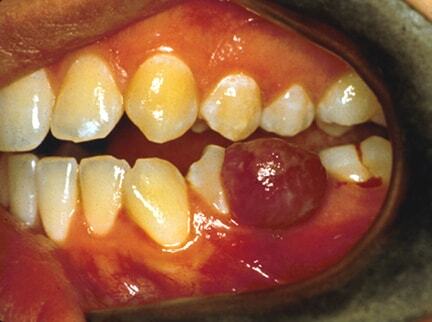 Diagnosis 2: It can be gum inflammation due to intake of hot or hard food stuff. Treatment 2: It is advised to do warm saline gargles thrice daily and change your tooth brush to soft bristles tooth brush. Maintain a good oral hygiene.